Arriving home after some pre-holiday travels, we were anxious for some boating close to home. 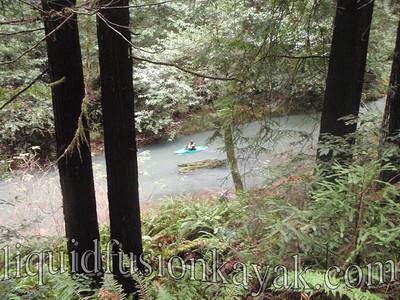 We decided on an exploratory paddle of the South Fork of the Noyo River - a class 1 tributary of Fort Bragg's Noyo River. 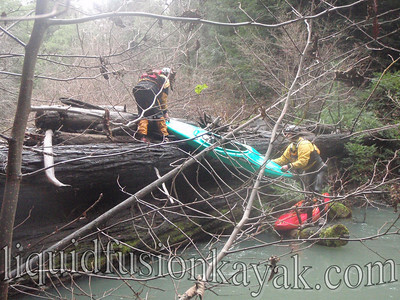 We have heard nightmare stories from locals trying to run the Noyo's South Fork at flood stage. Our plan for the trip was to enjoy the scenery and wildlife. 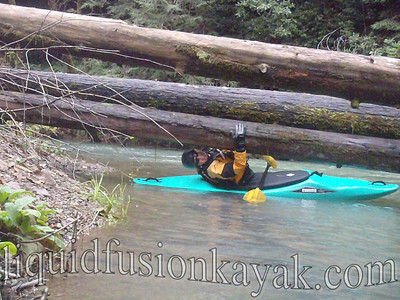 Being in a wooded area, log strainers are inevitable hazards so we chose a flow that would be high enough to float us down the river but mellow enough for us to limbo under logs and easily get in and out when necessary to portage obstacles. 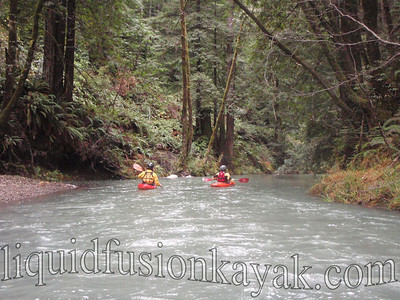 Our journey entailed approximately 4 miles of paddling (and portaging) on the South Fork of the Noyo River followed by 4 miles down the Noyo River to our shop at Dolphin Isle Marina. The trip met our expectations lots of log strainers and great scenery and wildlife watching. We limboed 12 logs and portaged numerous times. Our favorite sitings of the trip were 6 Coho Salmon and numerous American Dippers. We came across a couple of the Department of Fish and Game surveyors wading the river and counting salmon. 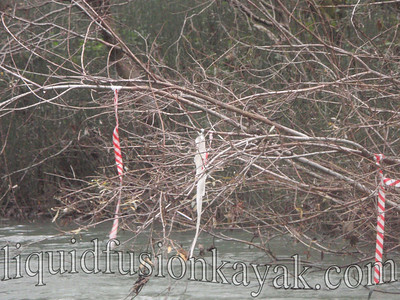 Talking to them, we discovered that the candy cane striped ribbons that we were seeing along the river were their markings of Coho Salmon sitings. 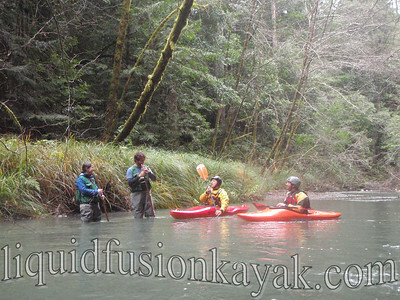 In addition to enjoying the scenery and wildlife, we realized that the run was a good preparation for our upcoming swiftwater safety class for the local fish surveyors. Check out our photo gallery for an entertaining photo slideshow of our adventure.